Advent of this millennium has seen an unprecedented rise of crimes especially home invasion because as per criminals homes are soft targets. This is the reason we are here discussing about the Amcrest 960H Security Camera System Review. With a long distance transmit range of 984 feet and LED night vision features; this is a security system which is synonymous with reliability, security and safety. 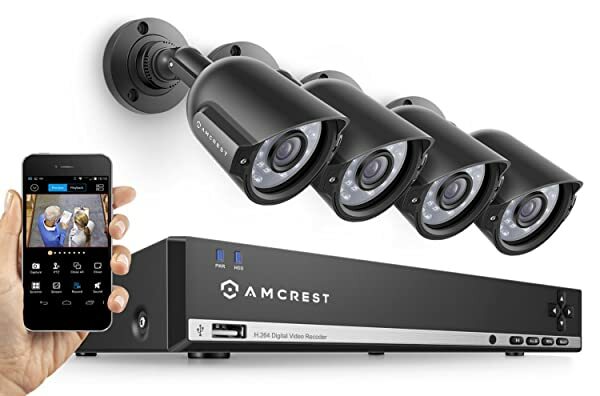 Amcrest 960H Security Camera System Review has a lot of features that attests to its claim of being one of the best in the market. The recording done on this security system is often said to be of professional quality which is a compliment towards its commitment of absolute security. With advanced motion detection features, this is a formidable opponent for the burglars. To top it off, the fact that this is a weatherproof security system makes it all the more tempting for people who consider home security as their topmost priority. So without wasting any more time let us have an in depth analysis of the Amcrest 960H Security Camera System Review. It is very important to know the components that you get with the security system- as it will help you understand the product better. The first thing that we need to mention is the 1x500GB hard drive. This is the storage device that makes sure that all the recordings made by the camera are properly stored. Next is the 4CH power supply which plays an instrumental role in controlling and channelling the power supply to the security system. You will also get 4 60ft cables that come in handy during the installation phase. You need these cables to create the network for the security system. You will also receive 4 800TVL Bullet Cameras which will be your eyes around the house at all times whether you are home or away. They will make sure that the house is safe. There will also be the 960H channel DVR which is the heart of the system, so be careful with this device. The package will also include the warranty and the manual book. This manual book will help you in understanding the functionality of the system better. The motion detection feature of this product is top of the line. Here you can customize the feature as per your requirement from the DVR. You can make changes to the settings and select 24×7 motion detection where you can specify when the systems need to be active and when not. You can also specify the perimeter zone that will be under surveillance for motion detection. If there are any anomalies here then it will send you alerts via email or activate the DVR buzzer. 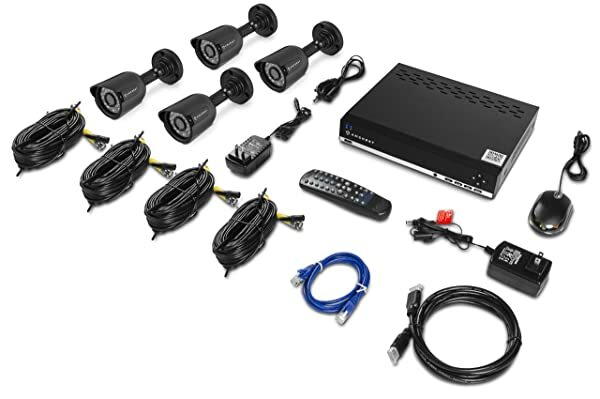 The DVR of the security system acts as the central hub and is better than an IP based system. You can remotely access the feeds of the recording from your PC, tablet, Smartphones and other smart devices without a glitch. The camera of this product is exceptionally good and is known to provide the best possible pictures thanks to the advanced image sensors which have a much better resolution; plus the picture here come in high definition. The 800TVL makes sure that the feeds that you are getting from the camera are best and crisp and remember that all this is the real-time feed we are talking about. The lens dimension of the system is 3.6mm which allows for a better coverage and will only be an advantage to you. Plus this camera is equipped with the night vision feature which is something that is very much needed these days. Moving on to the DVR, the video output of the DVR comes via HDMI, VGA and CBVS route. The system requirement of the DVR is windows 7, Vista, XP and 8. Remember that it can only work on Internet Explorer and no other platform, even MAC, so be careful that you have it beforehand. Moreover, it records in various modes which include normal mode and intelligent mode where the later is triggered if the system detects anomalies in motion detection. One feature that sets this system apart is its niche for recording. The 500 GB hard drive can keep the feeds for 30 days where you can playback and view precious feeds over and over again. The camera has a vision up to 80 ft at night which is sure to assist you in the surveillance process at night. The camera is designed in such a way that on detecting low lighting, the infrared mode is automatically activated. Moreover, the camera has a 75° angle and therefore can cover a vast area. The cameras of the security system are weatherproof; hence you don’t even have to think twice before placing them in the harshest of conditions including the winters. The IP66 heavy-duty metal makes sure that the camera is safe in any weather condition. Here you have the option of keeping the back up of the stored footage in an USB memory stick or even transfer it to an external hard drive. You have a plug and play setup in place which makes the installation of the security system even easier. The cameras are weatherproof but they are not waterproof. Therefore try to make sure that they don’t come in direct contact with water. The amcrest link app helps access the remote feed coming from the camera on smart devices. After analysing the Amcrest 960H Security Camera System Review, we can safely say that this is the surveillance system of the future. With features of night vision, motion detection and different modes of recording, there are hardly any flaws. So we can conclude that it is a reliable product and good security system that you can consider for your home but the ultimate choice, as always, lies with you.